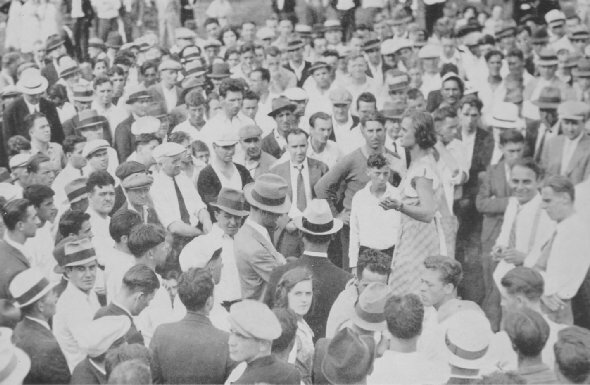 Ann Burlak, blazing communist, known as "The Red Flame", in a three hour harangue with textile mill strikers, Fall River, Massachusetts. The radical students group at Harvard obtained faculty permission for "The Red Flame" to deliver a fiery oration in an historic Harvard University hall in November, 1934"believe it or not". choice. The students must support the University or they must support the radical's who are bent on bringing revolution and chaos to America." "Working through an organization of students of high school age and younger, communists are making an intensive effort to preach communistic doctrines in the District public schools, it was revealed today. "The Students' organization, fostered and financed by the Communist Party, is known officially as the National Students' League. "Endowed with this innocuous title, the organization is able to enroll many of its members without their being aware of its communistic background. "Washington school children of all ages are eligible for admission but leaders in the league are concentrating on building up the bulk of membership with boys and girls of high school and junior high school age. "So quietly have sponsors of the league been working that school officials, until appraised of the fact by The Washington Times, were completely unaware of its existence." Similar situations exist in the high schools of all of the metropolitan areas of the United States. The High School Outpost, a communist paper, is distributed to students in many of the high schools every week. "The National Guard.The National Guard is a more fertile field for communist propaganda, which is fairly widespread through the country. The Young Communist League handles this propaganda and uses every effort to break down the morale of the National Guard and discourage enlistments. The committee has on file numerous revolutionary documents issued by the Young Communist League calling on the National Guard soldiers to turn their guns on their officers and on all employers of labor and so-called capitalists. "Numerous National Guard officers in various sections of the country testified that communists were enlisting in the guard and forming cells and nuclei which were difficult to discover, and it was even more difficult to secure conclusive proof against them. It appears from the testimony that the communists often entered the guard with the preconceived plan of serving in the machine-gun units. "Military training units in schools, colleges, etc.The evidence presented to the committee of communist attacks against military training in schools and colleges is extensive. Such activities have led to considerable agitation in some of the big universities. Opposition to military training in educational institutions provides a fertile field for inflammatory speeches and articles by young communists who pose as favoring eternal peace while advocating civil war and world revolution.